Doom Patrol Episode 8 splits the team into two groups. A cake with a map to a street that doesn’t exist is delivered to the manor with a note reading “Help me, Niles!” While Larry and Vic go to investigate, Cliff intercepts a call for Rita from Karen, one of Jane’s personalities that he’s never encountered before. Meanwhile, the question of what Jane’s painting of Vic standing over the defeated team looms over them all. Vic and Larry arrive to find themselves on Danny Street, a sentient, gender-queer street lined with dilapidated buildings. Danny uses signs to point the two to Peeping Tom’s Perpetual Cabaret, where they are greeting by the club’s spokesperson, Mora Lee Corrupt. Mora Lee explains that Danny jumps from place to place, collecting outcasts and existing as a refuge for people who have slipped through society’s cracks. The freaks. People just like them. Danny is powered by the good vibes of Danny’s citizens (the “Dannizens”). If the party stops, then Danny dies. Lately, Danny’s citizens have been scared. Danny is being hunted by Darren Jones and the Bureau of Normalcy. Years before, one of the Bureau’s agents encountered Danny on the Bureau’s kill mission. Rather than being appalled, Agent Wilson felt right at home with Danny and the Dannizens. So, Wilson tipped Danny off about the Bureau’s raid and stayed as Danny jumped away. Mora Lee was Agent Wilson. Larry is familiar with the Bureau. After his accident, the Bureau kidnapped and tortured Larry in an attempt to turn the energy inside of him into a weapon for the Department of Defense. Instead of rallying to Danny’s defense, Larry wants to run away from the Bureau in spite of Vic’s protests that they stay and defend the innocents. Larry’s still no hero. According to Rita, whenever Jane is especially low, Karen surfaces. Karen is a love-struck romantic who uses her abilities to target one particular individual, Doug, and make him love her. Hammerhead manages to surface and begs Rita to stop Karen before she’s too powerful to wrest control from. Though Rita tries to reason with Karen, Karen uses her power to get Doug, his family, and Rita to go along with her plan for Karen and Doug to be married immediately. Cliff, however, is immune to Karen’s controlling gaze. Cliff knocks Doug aside and tries to carry Karen away, allowing Hammerhead to break through once again. Hammerhead still hates Cliff. Hammerhead is about to deal with the situation permanently by killing Doug, but Karen stops him. Her energy sapped, Karen is dragged away into the Underground of Jane’s mind, leaving Jane a catatonic husk with no one in control. 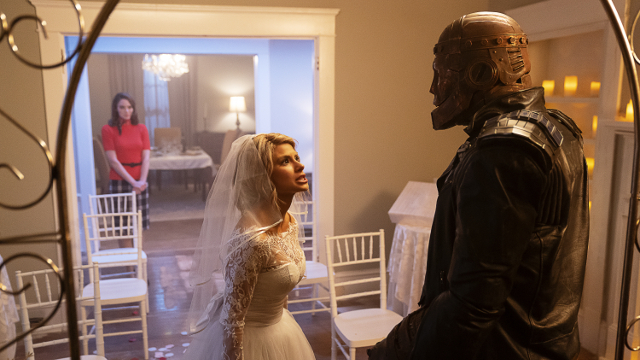 Let us know what you thought of Doom Patrol episode 8 in the comments below!